FREE Project Kit and Instant Gratification At It's Finest! Come join me and my L-INKed with Friends group and receive an additional FREE Project Kit only for a short time. PLUS, if you sign up between July 15 and August 31, 2013, you’ll get to pick one of four project kits for FREE in addition to your starter kit! These kits are packed with brand-new products—you won’t want to miss out on this special offer. The first three project kits are from the holiday catalog (receive them early!) and the last option is from the annual catalog. FREE SHIPPING on your kit. That's another 10% savings! Fill up your Wish List! Receive 30% off your first Stampin' Up! product order of $150 or more plus qualify for hostess rewards. This option must be be redeemed within 45 days. Enjoy 20% off every day. 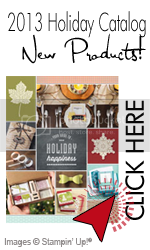 Also receive special incentive discounts for Stampin' Up! Demos only. You will be able to pre-order new products one month in advance of catalog releases! Attention Hobby Stampers! You can join just for fun and discounts! There's never any obligation to sell or hold workshops and no penalty if you decide to drop. You get to keep all your goodies. Easy,Quick, and Fun. Purchase Your Kit Online from me and receive immediate benefits. Instant Gratification at it's finest! This card was made in Stampin' Up! 's My Digital Studio. I am not very good at the MDS which is why I am so proud of the card. I had no idea what I was doing and I could still do it!!! I am going to the SU convention this year and I signed up for a class to learn more about MDS. You can also go to the website and view videos with tips and tricks. That is for another rainy day...tomorrow. Go to my website to learn more about MDS and all of the wonderful products in our freshly released catalog. So head on over to the Paper Craft Crew website to enter your card sketch. We look forward to seeing more inspiration from all of you. Have a great and dry day.